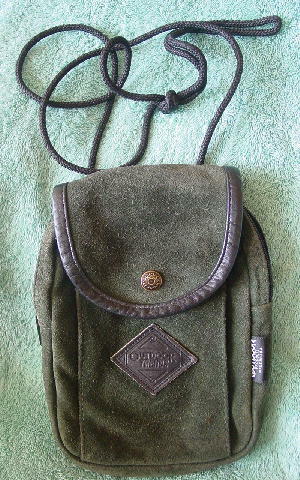 This dark green suede and black fabric hiking/camping purse was made in the U.S. by Outdoor Products. The front flap has a snap closure and a 58" black cord shoulder strap which has been knotted and can be pulled inside. The fabric bag has a belt loop and a zippered compartment. The top has an 11" long zipper opening and the interior black fabric lining is the same fabric as the back exterior. 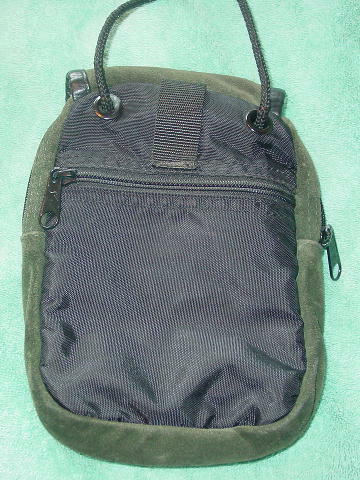 There are 4 interior open pockets in different sizes and a net zippered pocket. 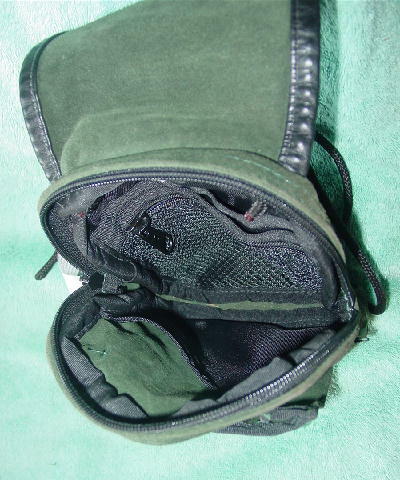 The front has an open pocket which has the bottom of the snap closure on its front. The front has a black diamond shape tag with Outdoor Trends etched on it. She sold it because her new boyfriend only likes to surf.